The one easy part of taking your pet to the vet's office is getting him on the scale; the other part is reading his weight. Well, Hammacher Schlemmer has an electronic scale like the ones at the vet's office that you can use at home... and it's on sale while supplies last! Of course you could try holding your pet while weighing both of you together, deducting your weight from the total to reach hers.... but you don't really want to know your weight, do you? Besides, you can only accomplish this method with a small pet that you can see over, but not too small a pet that weighs less than a pound. 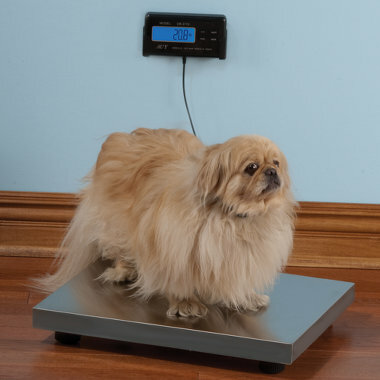 Instead, you can get a precise electronic scale with a pound, ounce, or kilogram readout of your pet's weight by just walking him over to the scale and putting a treat on it, if necessary. The electronic Pet Scale is powered by an AC adaptor or batteries. Right now it's on sale while supplies last at Hammacher Schlemmer, and it comes with a lifetime guarentee. Note: This scale only measures up to 130 pounds. Check out the Convertable Dog Gate/Kennel too!